No season is ever going to be perfect and this one was no exception with the sad loss of people very much attached to Burnley Football Club in one way or another, and such a sad loss occurred on Saturday 26th October 1991. 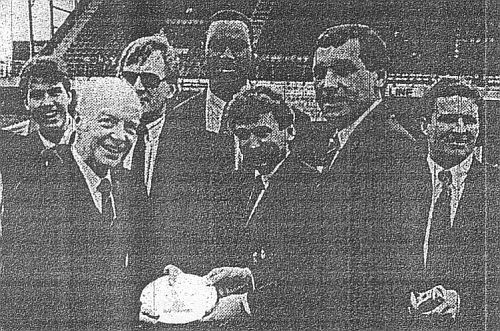 As we prepared for our game at Lincoln, the news came through that Granville Shackleton, former sports editor of the Burnley Express, and previously with the Lancashire Evening Telegraph and Burnley Star, had passed away at the age of just 64. I'd known Granville for some years, and considered him a friend. We travelled to many an away game together on the same coach and he was great company. He'd been with the Telegraph, reporting on the Clarets, during the 1960s and early 70s and then joined the Burnley Express, eventually taking over as Sports Editor from Peter Higgs at the beginning of 1984. He held that role until he was forced, through illness, to retire in early 1991. If someone asked me to describe him, I would say he was a gentleman and also very much a gentle man (and you will see those words repeated below). He was also a very genuine man who was so easy to like. I, personally, have a very good relationship with the Burnley Express and the sports staff, and that's been the case throughout the decade I've been involved with Clarets Mad. It's something I really appreciate and am always thankful for. I know that it would have been just the same in Granville's era. I know he would have gone out of his way to help, that's just the man he was. My favourite story of Granville, however, was away from football. He was once caught, along with a number of others, drinking after time in a local hostelry. The editor of the Burnley Express assured him that his name would be kept out of the paper. Granville was having none of it and insisted that he should be named alongside the others. In truth, I think he was quite proud of it rather than wanting to hide it. 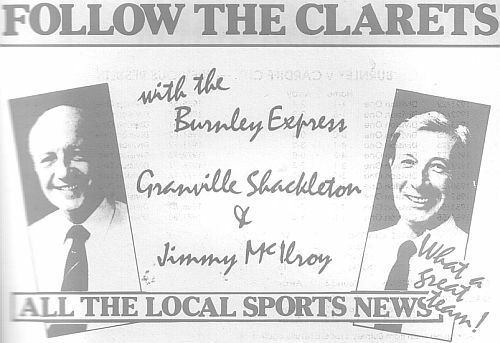 On his death, tributes poured in from fellow journalists, from Burnley FC, from local cricket clubs, from the Supporters' Club but perhaps the most poignant came from his deputy at the Burnley Express, Jimmy McIlroy. Jimmy said of his friend: "After sitting opposite him at the Express sports desk for the past eight years, following almost a decade when we both churned out sports news for the Lancashire Evening Telegraph, and before than an association that goes back to the great days of the Clarets, I feel it is the end of an era and I feel a great loss. "One of the mildest men it has been my privilege to know; but meakness wasn't weakness, because he could be as hard hitting and as critical as the situation warranted, as any Burnley FC manager going back to the days when Harry Potts was in charge, could confirm. "Without going all sentimental, I will miss this gentle man. All the years I've been in his company I've never known him raise his voice. Coming late into journalism, he taught me a lot and unbelievably we never had a cross word, though goodness knows, he often had cause to hit the roof at my inexperience." In preparing this piece, I thought the last word should be with the man who succeeded him as Sports Editor at the Express, and so I asked Edward Lee for a few words. He was only too pleased to help and below is what he told Clarets Mad about Granville Shackleton. The day after Burnley FC legend Jimmy McIlroy celebrated his 60th birthday, the club lost a long-standing and faithful servant. Granville Shackleton may never have kicked a ball in anger for the club, he may never have made a managerial appointment or signed a player – but he was definitely a legend in his own right as far as the club is concerned. In these modern days of instant access to everything connected to a football club, it can be truly difficult for a reporter to make his mark. But that is certainly something that Granville did – and it really is true to say that characters like Granville will never again grace the world of local sports journalism. He came from an era of sports reporting legends. My first boss, Noel Wild, was one. Don Smith was another. Granville certainly deserved to rub shoulders with all of them. When I first decided to try my hand at sport reporting, Noel Wild and Granville were the two who helped me on my way. Don Smith, though retired by then, also played a part as he saw a spark of something in what I was trying to do. They had all been Banned By Bob in the 1960s, but their love of life at Turf Moor never went away. Noel Wild taught me more about words than anyone could ever imagine. Don Smith enthused about anything to do with local sport. Granville, along with Keith McNee, showed me it was possible to write about a club you love. Others, notably Peter Higgs – I was lucky to know and work with some of these Titans of the written word – played a part in helping to hone my fledgling skills. With Peter Higgs in exulted Sunday Newspaper company, Don Smith sadly dead along with Keith McNee and Noel Wild retired, I moved to the Burnley Express in the summer of 1990. I went as a page designer but Granville was off work with serious illness and the editor of the time, Richard Catlow, asked me to sit with Jimmy McIlroy on the sports desk until Granville’s return. I sat there for a day short of 19 years! Moving to the Express to work in the same office as Jimmy Mac was always going to be a treat. So was learning more from Granville but sadly we never worked together. Within three months Granville had taken early retirement. A year later he was dead. Curiously, the weekend before his death I had written an article about Granville in the matchday programme. It was read out at the funeral and I meant every word of it. Granville was from a family of reporters and he both earned, deserved and was rewarded with respect. He travelled on supporters’ club coaches and often reported from the terraces. He knew everyone connected with the club and felt the pain of failure as much as the joy of success as much as anyone else I have ever met. He was also a kind and gentle man who would always offer friendly advice and assistance. The majority of the time I have contributed to the Clarets Mad message board, Granville’s name has been part of my username. That stemmed from my days with the No Nay Never fanzine – a fanzine I know that Granville greatly enjoyed – and I was happy to steal his name. It is difficult to sum up his writing – but if you want to get a taste of the way in which my old friend and colleague Granville Shackleton went about his business simply take a look at his report on the Orient Game – enough said!